The 123rd Boston Marathon is April 15. The Boston Marathon and the Patriot’s Day Parade will be held on Monday, April 15, 2019. The BAA 5K and the Invitational Mile will be held on Saturday, April 13, 2019. Street closures and parking restrictions will be in effect in the Back Bay, Beacon Hill, Brighton, Fenway-Kenmore, North End and Government Center. People coming into the City for the events are urged not to drive their personal vehicles. Information on Bluebike rentals may be found here and information on the MBTA may be found here. For a faster return trip, the MBTA advises riders to purchase a round-trip rather than a one-way ticket. Walking is also a great way to move around Boston. There will also be $15 unlimited rides available on the commuter rail and $5 Charlie cards available on Patriot’s Day. At 6 AM, traffic will be prohibited from Charles Street, between Boylston Street and Beacon Street. The 5K will begin at 8:00 AM on Charles Street near the Center Gate of the Public Garden and is expected to last about one hour with roads opening up as the tail vehicle passes. An estimated 10,000 runners will turn right onto Boylston Street, right onto Arlington Street, left onto Commonwealth Avenue outbound via the underpass at Massachusetts Avenue, left onto Charlesgate West, left onto Commonwealth Avenue inbound via the underpass at Massachusetts Avenue, right onto Hereford Street, left onto Boylston Street, left onto Charles Street. The Invitational Mile will start following the 5K. Formation will be on Boylston Street prior to Dartmouth Street, and the route will be Boylston Street, left to Dartmouth Street, left to Newbury Street and left to Exeter Street. Boylston Street, from Hereford Street to Clarendon Street, will be closed; along with Newbury Street, from Clarendon Street to Fairfield Street; and Exeter Street, from Newbury Street to Boylston Street. There will be parking restrictions and road closures across Back Bay on Marathon Monday, April 15. Spectators are encouraged to leave their cars at home and use public transportation. More information on parking restrictions and road closures will be posted soon. There is now a Boston Marathon Mobile App to track your favorite runners, get information on the course, and more. 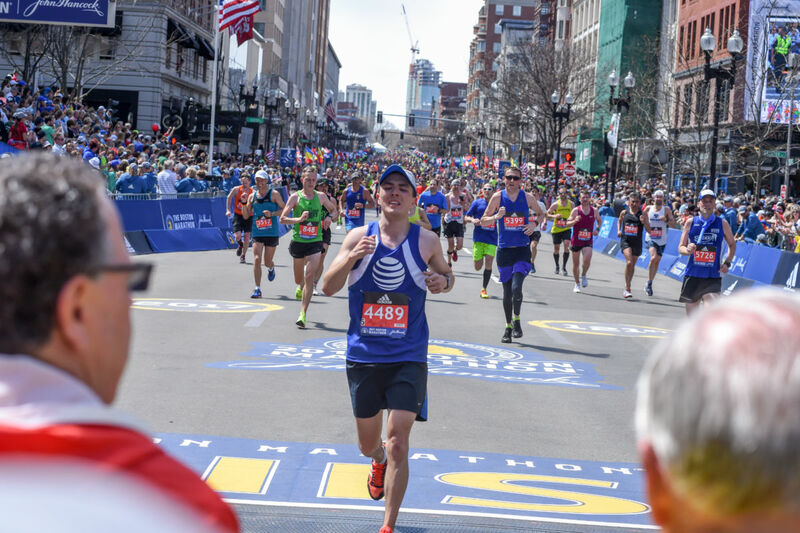 AT&T is also offering Athlete Alerts on your favorite Boston Marathon athlete! To participate, text RUNNER to 234567 to receive your AT&T Athlete Alerts. You will receive six race day text alerts as your athlete reaches the 10K, 13.1-mile, 30K, 35K, 40K, and Finish Line! Check back here often for even more information about race day.